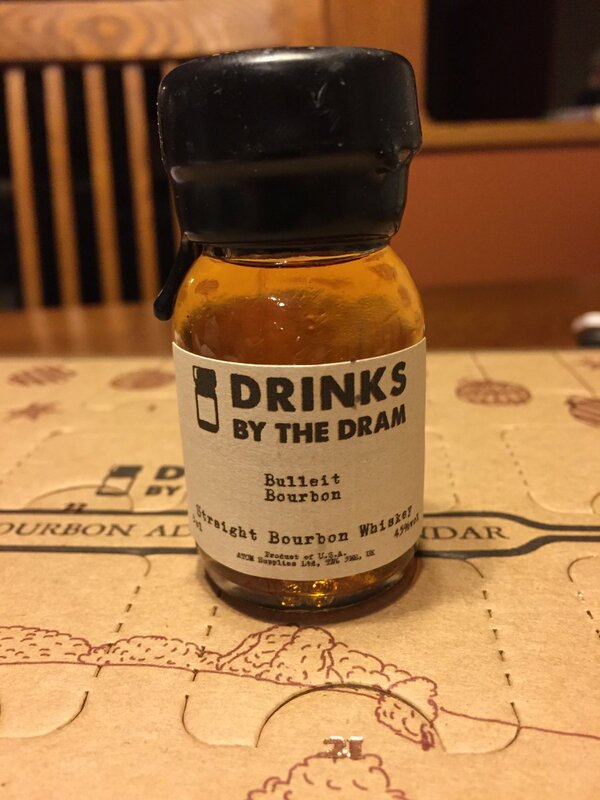 Day 2 is Bulleit Bourbon, a “straight bourbon whiskey” that’s 45% alcohol, made in USA. I’m suspecting they’ll all be US-made, but I don’t know! That’s part of the fun. I’ve had Bulleit Bourbon before, and liked it, so this is a good chance to figure out what my scale is about, since this is a reference point. Initially it has a light nose, and it stays light as the bourbon warms up. It smells like bourbon – or rather, what I think of as the traditional bourbon smell, which is mostly alcohol with notes of wheat and honey. Little to no corn in the aroma. The flavor is smooth and rich, and familiar. It’s got a sweet note, not quite honey but something like it. A wee hint of smokiness, maybe? It has a pretty long finish, with a nice burn. The Bulleit web site tells me that the bourbon has an “especially high rye content” which is interesting, and that it has “tones of maple, oak and nutmeg.” I’ll buy that. I rate this one three stars. Not my favorite, but definitely something I like and would recommend.